In a large bowl, stir together the flour, salt and yeast. Combine the wet ingredients together, then add them to the flour mixture. Mix (your clean, floured hand is fine) to moisten all the flour. Cover and let sit (ferment and autolyze) for 12-18 hours. When you’re ready, take the now bubbly dough and knead it for about 15 seconds. You can do this on a floured surface, but I like to knead it right in the bowl with a cheap plastic bowl scraper, sprinkling a little bit of flour down the sides of the bowl so it coats the dough ball. 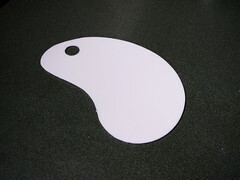 Place about a foot-long sheet of parchment paper into a small bowl. 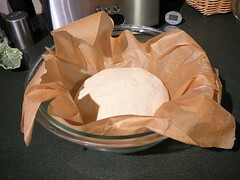 Form your dough into a ball and plop it on top of the parchment. Cover and let rise (proof) until doubled, usually between 2-2 1/2 hours for me. About a half-hour before you’re ready to bake, preheat your oven to 500 F with the baking vessel inside (cover and all). Give it an extra 15 minutes or so of preheating to allow the vessel to reach temperature. When the dough is doubled, slash the top of the loaf, then carefully transfer the dough, parchment sling and all, into the hot baking vessel. 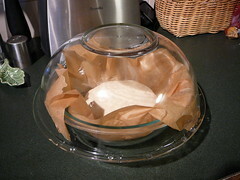 Cover vessel and return it to the oven, but reduce the oven to 425 F.
Uncover and bake for an additional 20 minutes, or until the center of the bread reads an internal temperature of 210 F.
Remove bread to a cooling rack for an excruciating couple of hours while you wait for it to be ready to slice. Their improved No Knead 2.0 recipe can be found in an excellent iTunes video podcast. This recipe takes very little work but lots of time. The long wait at the beginning allows the combination of liquid and all purpose flour to produce strands of gluten which give the bread its texture. Yes, this recipe takes a lot of clock time, but barely any work time. I make it on a workday by mixing late one night and then baking the next evening. The long ferment time is actually a boon; you can really adjust it from 8-20 hours without causing much harm to the bread. That’s an enormous window to figure out how this recipe fits into your schedule. The only bother is the 3.5 hours on the baking end for the proofing and baking. But you can knead and let the thing proof while you’re out grocery shopping for an hour and a half. Use an instant read thermometer to measure the internal temperature of your bread. If you don’t have one, your bread really is probably done after 20 minutes cooking uncovered. The bottom will be a little dark on this bread, even if it’s cooked according to directions. Also, the top crust can get very dark. Personally, I like the flavor this brings out in the crust. These ingredients improve the flavor of this shortcut bread. I have increased the amount of beer over the CI recipe, but I try not to use a hoppy beer. I actually like Sam Adams Boston Ale. But Budweiser, Coors, and Miller will do. Strictly speaking, you don’t have to slash the loaf. I do because I like the way it looks and I want to encourage the bread to really spring up in the oven. Use a razor or very sharp knife. if you find the dough too sticky to slash, snipping the top of the loaf with kitchen scissors works, too, and can create some pleasing crust shapes. Actually, I’m putting together a photoset of pictures related to steps in this recipe (filling out the steps as I remember to take photos; usually I’m focused on the cooking itself). You can see my Low-Knead photoset here on Flickr. Use oven mits and take proper precautions against burning yourself whenever you are working with a really hot oven. I'm glad you posted this, because you gave me the recipe a few weeks ago and I deleted it by mistake. :( I'm not gonna lose it this time!